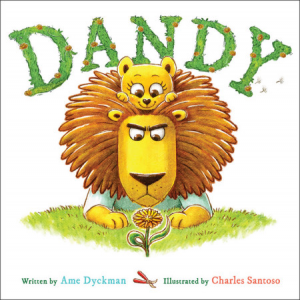 Award-winning author Ame Dyckman’s picture books provide plenty of laughter during storytimes and bedtimes. Ame is the award-winning author of Boy + Bot; Tea Party Rules; the New York Times bestselling Wolfie the Bunny; Horrible Bear! ; You Don’t Want a Unicorn! ; Read the Book, Lemmings! ; Misunderstood Shark; Huggy the Python Hugs Too Hard; Roary the Lion Roars Too Loud; Misunderstood Shark: Friends Don’t Eat Friends; the third board book in the Wee Beasties board book series, Touchy the Octopus Touches Everything; and her latest picture book Dandy. Hi Ame. Three books coming out this spring—WOW! If you were to describe each book with three adjectives, what would those adjectives be? 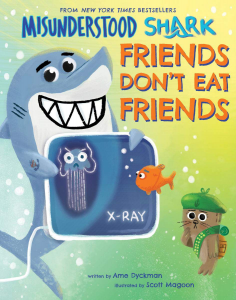 My fiction-with-nonfiction-facts picture book MISUNDERSTOOD SHARK: FRIENDS DON’T EAT FRIENDS (ill. by Scott Magoon, pubbed 1/29/19) is… ZANY, INFORMATIVE, and FUNNY! 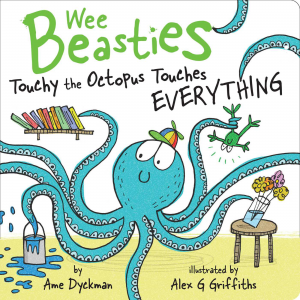 My social manners board book TOUCHY THE OCTOPUS TOUCHES EVERYTHING (ill. by Alex G. Griffiths, pubbed 3/19/19) is… KID-TRUE, HELPFUL, and (you guessed it!) FUNNY! We love that you are so creative with your characters and are wondering what draws you to write about the specific animals you choose? THANK YOU! I often use animal protagonists because animals can represent EVERYBODY. We’ve all at one time or another been a hungry (or HORRIBLE!) bear, a worried-but-brave bunny, a misbehaving-but-denying-it shark, etc., and I want all readers (especially kids) to be able to see themselves in my characters. But when using human characters, it’s important to represent diversity, so kids can see themselves visually as well as emotionally. I’ve finally written a (not-announced-yet!) human classroom story, and I can’t wait to see all the kiddos! Read the Book, Lemmings! and Misunderstood Shark have such fun endings. When you begin writing a picture book, do you know what the ending will be? You write some of the most humorous books so our readers are wondering what makes you laugh? What’s the funniest joke you have heard? Several of your books have been translated and are sold all over the world. Can you tell us a little about the process of getting a picture book translated and in the hands of children everywhere? I’ve been extremely fortunate that ALL of my published picture books have been translated in one-to-multiple languages (Spanish, French, German, Dutch, Hebrew, Chinese, Korean, Japanese, ETC.—even Finnish and Norwegian!) for little readers all over the world. (I treasure each of these translated books—even if I can’t read them! I’m only fluent in English and Five-Year-Old!) Luckily, each of my publisher’s amazing Translation Departments takes care of nearly all my translation work—I usually only chime in when we’re creating other English editions (for sale in the United Kingdom, Australia, etc.) and I’ve used a particularly American English phrase I need to substitute with a more locally-appropriate one. And even then, I have FABULOUS advice from our regional editors. With so many books written in just a few years, you must never suffer writer’s block. Do you have a writing schedule/routine? If we were to visit and look at your bookshelf, what genre would we find the most represented? *LAUGHING* Picture books! I own shelves and shelves AND SHELVES of picture books and basically no “grown-up” books. (Unless they’re grown-up books ABOUT picture books! HA!) There’s also a shelf or two of classic MG (Roald Dahl, etc.) and a bit of supernatural/fantasy/contemporary YA for plane trips. But when packing for a car trip, I’ve been known to bring an extra suitcase (or two!) full of picture books! 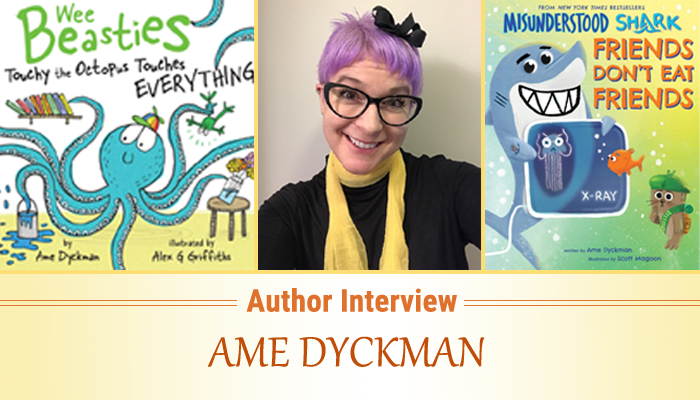 Visit Ame on Twitter (@AmeDyckman), where she posts book news, goofy poetry, and pretty much everything that pops into her (frequently color-changing) head!